Thousands demand health care now! Sponsored by more than 200 grassroots organizations, the demonstration was swelled by busloads from Yakima, Spokane, Vancouver, Bellingham, Mt. Vernon, Everett, Olympia, Tacoma and the Tri-Cities. It was part of a national day of action for health care sponsored by Healthcare-NOW, a coalition that advocates single-payer health care such as Rep, John Conyers’ HR-676 “Medicare for All” legislation. Events were held in 50 cities on or around May 30. The mobilization is building toward a June 25 demonstration in Washington D.C. that is expected to draw tens of thousands. Dan Burdick traveled by car, two ferries, and three buses from Port Angeles on the Olympic Peninsula to join the march. Self-employed as a homebuilder and cabinet maker, he must purchase health insurance for himself with high co-pays and deductibles. “I’m an example of someone who would benefit tremendously from single-payer healthcare,” he told the World. Felicia Yearwood marched with the Seattle Human Rights Commission. “As long as we have a system based on insurance company proifits, we will never have sustainable health care,” she said. Gabrielle Lavalle was wearing the long, pink gown of a beauty queen, with a ribbon that proclaimed, “Miss Universal Coverage.” She said her concern is the cost of wars and weapons. “If we eliminated nuclear submarines and closed the 700 military bases we have around the world there would be plenty of money to provide health care for everyone,” she told the World. Carmen Miranda marched with El Centro de la Raza. 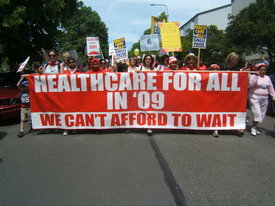 Their banner read, “Cobertura de Salud para Todo en el 2009.” (Health care for All in 2009). She said she worked for many years among migrant farmworkers in Eastern Washington. “These are workers who get injured in the fields, are exposed to pesticides, yet they have no health care. These are the people who put food on our tables. People are dying for lack of health care.” She urged a fight to remove from some health care reform bills clauses that would deny coverage for undocumented workers and their families. She assailed the foes of health care reform and urged a movement of “moms in tennis shoes” to help galvanize the grassroots movement to overcome that opposition. Amid the applause, many in the crowd shouted out “single-payer,” as she spoke. Ten-year old Marcelas Owens, told the crowd that her mother “fought for health care for everyone” and died as a result of not getting proper care after an illness caused her to lose her job and her health insurance. “I’m marching today to continue her fight,” she said. The two-mile march ended at Westlake Center in downtown Seattle. Deanna Knutsen, co-chair of Washington CAN (Community Action Network), a veteran health care advocate, told the crowd that thousands are rejected by the for-profit health insurance corporations because of “preexisting conditions,” a crisis that can only be solved by a universal plan that covers everyone, she said. Kim Armstrong, a registered nurse and leader of the Washington State Nurses Association deplored the fact that 47 million people are without health insurance. She said nurses are “acutely aware” that millions of uninsured people postpone going to the doctor until too late and die while others pay for medical care on credit, fall into debt and lose their homes in foreclosure and bankruptcy.